I have been bouncing between two projects lately. The first being an oil painting that I am not ready to put up pictures of, and the second being a collage (the largest that I have created so far) which I have uploaded the in progress image. It is my version relaying the essence of the character Jacob Marley from Charles Dickens' novel, A Christmas Carol. My character is bound and weighed down with the chains that she has subconsciously built herself. The burdens she wears range in all sizes and shapes, showing the different events that she holds herself accountable for. 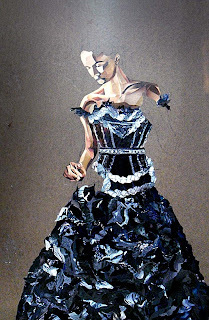 She wears a corset, further emphasizing the constraints she places upon herself, over a black dress, tattered and worn. She mindlessly tugs at the ropes of pearls that wrap around her neck, and peers down lost in thoughts of the past. Her hair is bound tightly, covered by a decorative flower, another worldly possession masking her inner beauty. Lost amongst the other necklaces, is one small chain holding a key. A key that will unlock her burdens, loosen her chains, and set her free.